The development of a novel gas-source, multiple collector, high mass resolution, isotope ratio mass spectrometer was completed in 2014. The instrument is capable of unprecedented measurements of isotopic bond ordering in methane gas, which will allow DCO scientists to accurately define the origin and provenance of various sources of methane. The “Panorama” also allows for investigations into rare isotopologue abundance as well as other new applications, representing a major step towards developing a new branch of isotope chemistry. No other existing facility can provide this level of flexibility owing to the high mass resolving power of the Panorama coupled with its high sensitivity and multiple collection capabilities. The Panorama has now been installed at the Geology Building at the University of California Los Angeles (UCLA), USA under the supervision of Edward Young, a researcher in DCO’s Deep Energy Community. This unique instrument has been made possible by funding from the Alfred P. Sloan Foundation on behalf of the DCO, the U.S. National Science Foundation, the U.S. Department of Energy, Shell Oil Company, the Carnegie Institution of Washington, and UCLA. A major DCO instrumentation objective is to measure ratios of methane molecules with doubly isotope-substituted rare isotopes (13CH3D vs. 12CH2D2) that might provide information on methane formation temperature and may help resolve questions related to abiotic versus microbial origins—a DCO Decadal Goal. 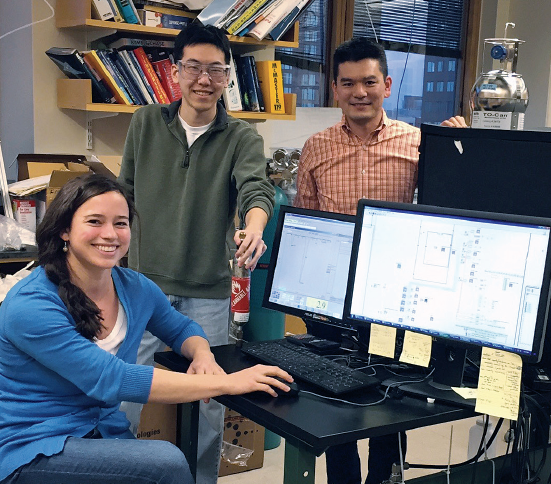 In addition to providing support for the Panorama High-Resolution Mass Spectrometer, the DCO encouraged a second science team, who proposed a radically different concept for clumped isotope measurements based on quantum adsorption spectroscopy. With highly leveraged start-up funds from the DCO, a high-risk, high-reward alternative instrument was developed by Shuhei Ono, MIT, at a low cost and with potential for mobilization and miniaturization for field applications. Volcanic degassing is the main pathway of carbon release from the Earth’s interior to the atmosphere. To constrain Earth’s deep carbon cycle, we must first quantify the relative contribution from various gas sources of volcanic origin. Quantitative knowledge of the isotopic composition of outgassed CO2 - specifically 13CO2/12CO2 ratio - contributes to identifying carbon sources and therefore to validating degassing models. Understanding these carbon fluxes is critical to the overarching goal of DCO’s Reservoirs & Fluxes Community to identify Earth’s principal deep carbon reservoirs, to determine the mechanisms and rates by which carbon moves among these reservoirs, and to assess the total carbon budget of Earth. Achieving these scientific goals requires developing technologies and instrumentation that deliver data at relevant cost, temporal, and spatial scales. Damien Weidmann and colleagues developed a novel concept of real-time monitoring of carbon isotope ratio enabling compact, rugged and portable deployment. High-resolution middle infrared (2-20 µm) laser spectroscopy is used to precisely fingerprint isotopologues, which owing to their slight mass difference, vibrate with different frequencies that can be resolved by lasers. The advantages of this approach include precision, non-contact measurements, large immunity to interferences, limited sample preparation, real time measurements in a compact format, and possibility for absolute concentration measurements. Weidmann’s project consists of evolving a laboratory demonstrator into a field deployable instrument and conducting a first sortie to a volcanic field (La Solfatara, Campi Fleigrei). To this end, the instrument was shrunk and ruggedized, without loss of sensitivity. Dedicated field electronics were also designed to allow operation using portable power sources. Lastly, a specific gas handling system was designed and implemented to sustain the chemical mixture expected from the Solfatara’s fumaroles. In Summer 2015, the Laser Isotope Ratio-meter (LIR) was deployed for one week to La Solfatara, in collaboration with Stefano Caliro, INGV, Naples. During the campaign all aspects of the system were tested in real conditions and were found to be operating very well, in a very stable fashion. A series of isotopic measurements were made using different sampling approaches, whilst Caliro was simultaneously taking samples in the usual way for subsequent isotope mass spectrometry analysis. All data are being scrutinized in Fall 2015, but the instrument deployment was deemed a great success as it operated and collected data smoothly for an entire week. The campaign, supported by DCO, has allowed a clear validation of the LIR instrument concept in the field. The instrument will be improved based on the experience and data gathered, with additional deployment campaigns in the near future being planned. In the long term, the system will be ultra-miniaturized, using integrated optics technologies, in order to develop an unattended, autonomous, miniature LIR that produces high-quality, real time, streaming data on the isotopic composition of CO2. The ultimate objective is to have several sites instrumented with such a system. Two portable volcano mass spectrometers were built and extensively tested in the laboratory and in the field with partial DCO instrumentation support. The prototype instrument’s primary purpose was to autonomously monitor CO2 emitted from Earth’s volcanoes—essential to achieving DCO’s Decadal Goals. The system can be programmed to measure additional gases (N2, Ar, O2, CH4, He, H2) every ten minutes and store the data, which is downloadable to a laptop computer. This instrument can collect data autonomously for 3 to 4 days with a power consumption of 25 watts when measuring and less than 1 watt in sleep mode. With minor improvements and new power supply options (e.g., solar panel, wind generator), the system could be deployable for weeks without maintenance. 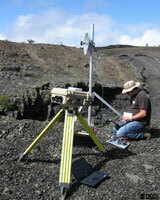 In 2012, the instrument was deployed at Lassen Volcano, California and at Halemaumau Crater, Kilauea Volcano, Hawaii. At present, the University of New Mexico is providing support to add solar panels and a water trap system that will make the system autonomous in harsh environments. High H2O concentrations depress the CO2 signal, which negatively affects detection limits. The current work is focusing on reducing the amount of sample drawn into the fore-line, thus reducing the overall amount of water and also removing the remaining water with the newly designed trap system. Once these issues are resolved, the instrument will be connected to a telemetry system that will allow investigators to control sampling intervals and collect data from the instrument remotely. Besides monitoring volcanic gases in plumes, potential instrument applications include monitoring of gases on oilrigs or pipelines, at CO2 sequestration sites, or for continuous monitoring of gases from geothermal production or exploration wells. 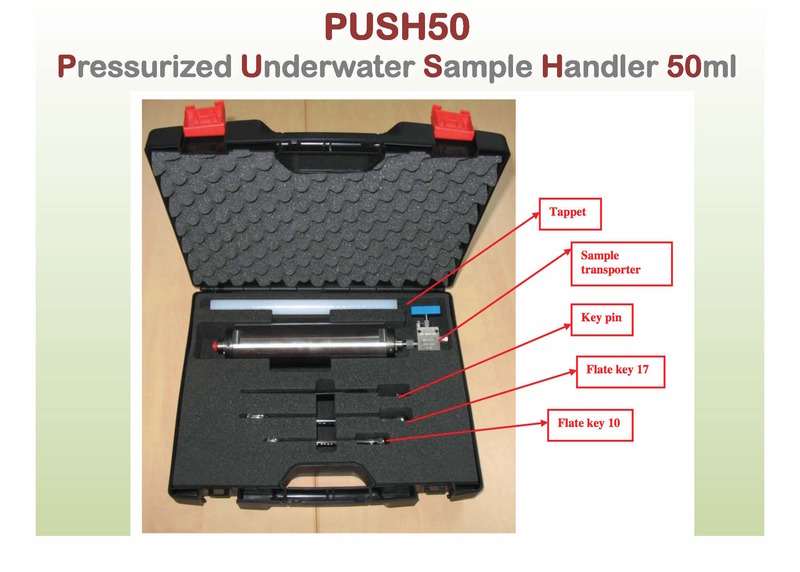 In addition to the DCO-supported prototypes, a deep-sea version was developed that is capable of measuring gases dissolved in water at seafloor depths. Thus, this instrument version may be of interest for deep sea drilling operations where up-to-date gas compositional information could be critical. Scientists from the USGS Cascades, Alaska, and Hawaii Volcano Observatories installed a novel sulfur dioxide (SO2) camera system at Kilauea's summit caldera in Hawaii in August 2013. 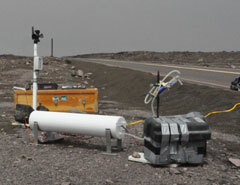 The system uses two ultra-violet cameras to continuously measure the emission rate of SO2 released from the active summit eruption site with imagery streaming in near real-time. Developed with primary support from the Richard Lounsbery Foundation, this instrument is one of the first camera-based SO2 gas monitoring systems installed at a volcano. 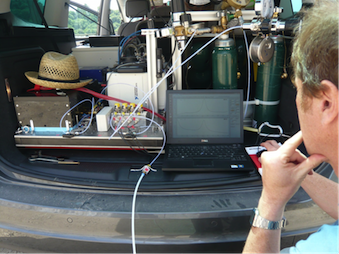 When paired with in-situ sensors measuring the molecular ratio of other gases such as CO2 to SO2 in the plume, the SO2 camera technology provides scientists with a method for deriving the emission rates of various volatile species from the volcanic system. The high spatial and temporal resolution of the instrument is expected to provide unique insights into degassing processes at Kilauea, with application to other active volcanoes worldwide. For more information contact Christoph Kern. Carbon-specific X-ray Raman spectroscopy (XRS) is the most definitive probe for in-situ, non-destructive characterization of the ubiquitous, significant changes in carbon-molecular bonding under high-pressure and high-temperature conditions. 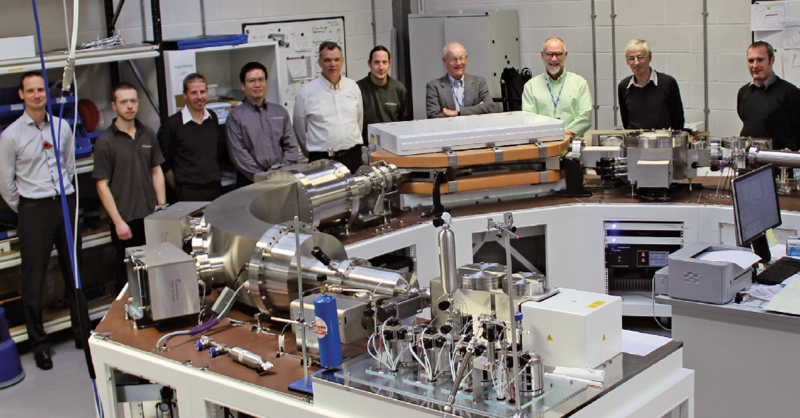 The DCO provided partial support for a Kirkpatrick-Baez (K-B) focusing system (pictured) that enables high-pressure carbon-specific XRS study at Beamline 6-2 of the Stanford Synchrotron Radiation Laboratory (SSRL), SLAC National Accelerator Laboratory. This new development opens the exciting capability of XRS to a broader community than ever before. The instrument was commissioned in April 2012 and optimization and improvements are ongoing. According to Principal investigator, Wendy Mao, the system is fully operational and open to the DCO community for use in x-ray spectroscopy experiments. The K-B focusing system’s construction was partially funded by the DCO and is one component of an ambitious five-year project that is supported in conjunction with the U.S. Department of Energy (DOE). The entire project will ultimately cost approximately $20 million with $3 million per year in operating expenses. A new large-volume, high-pressure-temperature device was developed and constructed with partial DCO support to explore the possibility of abiogenic synthesis of complex hydrocarbon systems in the upper mantle, the thermodynamic conditions of the synthesis of deep hydrocarbons and their migration to the surface, as well as the mechanisms of hydrocarbon synthesis reactions at very high pressure. The DCO funds for this large-volume, high-pressure apparatus and initial research were supplemented by support from the Russian Foundation for Basic Research and the Russian Academy of Sciences and other sources. Construction of the high-pressure apparatus was completed at the end of 2011. Other preparatory and laboratory setup work followed, including experiments for pressure-temperature calibration. Principal investigator Vadim Brazhkin and his team began research experiments in 2012 and published results are expected by the end of 2014. A modified gas chromatograph was developed with partial DCO support to help determine thermodynamic and chemical conditions required for abiogenic synthesis of complex hydrocarbons in the upper mantle, to investigate deep hydrocarbon synthesis and migration, and to explore the reaction mechanisms of hydrocarbon synthesis at high pressure. DCO funding for this instrument served as a catalyst to establish a new laboratory at Gubkin Russian State University of Oil and Gas with Principal investigator Vladimir Kutcherov heading the lab. The Russian Ministry of Higher Education and Science supported the development of additional high-pressure equipment for the lab. Furthermore, Gubkin University provided support for lab salaries, computers, and lab supplies. The gas chromatograph itself is being used to analyze the reaction products from experiments conducted with the other new high-pressure equipment. The chromatograph was installed in the new high-pressure laboratory at Gubkin University in October 2011 and tested afterwards. Dr. Kutcherov began the first series of experiments using the chromatograph in January 2012. The equipment will be available to others in the DCO community this year. A number of instruments relevant to DCO interests are under development at IPGP. Principal investigator Pierre Cartigny focused on the technical challenges and feasibility of using trace amounts of oxygen in diamonds to constrain their source (subducted versus mantle) and the oxygen fugacity of the mantle fluids from which the diamonds grew. The DCO funding leveraged additional support from IPGP for the purchase of two cryostats for distillation/purification of trace amounts of O2 from CF4 that will result from diamond fluorination. The award also supported investigation of the capability of measuring the isotope composition of oxygen in the context of imperfect CF4/O2 separation using high-resolution, gas source mass spectrometry. Earth’s greatest potential carbon reservoirs are the lower mantle and core, where even a few parts per million (ppm) carbon in metallic or silicate phases could represent many times the confirmed planetary carbon content. This ambitious instrument is designed to address the challenge of measuring trace amounts of carbon (1 to 10 ppm) in a variety of geologically relevant samples, including mineral phases that are nominally acarbonaceous. The Combined Instrument for Molecular Imaging and Geochemistry (CIMIG) involves the modification of an existing $2 million Time of Flight Secondary Ion Mass Spectrometry (ToF-SIMS) instrument at the Smithsonian Institution. It incorporates surface and depth profiling combined with an integrated sample preparation system for the detection and contamination-free 3-D mapping of inorganic and organic materials at ~100 nm spatial resolution. Nanoscale analysis is presently impossible by any other single technique. The combined instrument provides an unparalleled facility to analyze C-bearing samples that are not subject to the surficial contamination that plagues current instruments. It is being used to analyze a variety of samples, minute fluid inclusions, cellular fossil remains, bioflims, diamonds, and Martian meteorites. A number of samples important to DCO have been analyzed using various techniques that comprise the CIMIG instrument, although the components have not yet been physically integrated. This work proves that integrating these instruments is both desirable and productive. A major challenge is procuring additional funds and better physical integration. To date, analyses have been targeted at specific science questions that are appealing to a diverse range of funding opportunities and for use in proposals to various funding agencies. Simultaneously, the science team is planning how to handle community input to the instrumentation through use of remote access software. Designing and constructing a new generation of large-volume apparatus is critical to accomplish DCO’s decadal goals to investigate reactions under the extreme pressure and temperature conditions of Earth’s mantle; particularly reactions involving the evolution of mantle fluid phases. The “traditional” diamond-anvil cell (DAC) has become ubiquitous for experiments at P > 10 GPa, where only a microscopic volume is required. DACs provide access to a range of pressure-temperature conditions common throughout the mantle and approaching those of Earth’s inner core, while providing optical access to an environment that is chemically inert. However, for certain critical techniques the microscopic volumes of traditional DAC designs are insufficient. To address this need for increased volume, the science team proposed to develop a novel cell with single-crystal diamond apertures and target volumes of 0.1-1.0 mm3 capable of operating at pressures of more than 50 GPa. In addition to facilitating neutron diffraction in new regimes of pressure, this device—for the first time—will permit laser-heating techniques to provide access to unprecedented high temperatures (>1000°C). The science team initially held off in using the DCO/Sloan support in order to complete and leverage the results of a related project funded by the Department of Energy (DOE) via the Energy Frontier Research in Extreme Environments (EFree) program. The EFree-funded adaptation of conventional DAC design proved quite successful and brought the science team much closer to achieving their goals for the DCO project. The EFree experience provided clear concepts that they are now building upon in order to make another leap forward.